When he first spotted the planet Uranus through his homemade telescope back in 1781, the professional musician and amateur astronomer William Herschel at first believed he had discovered a comet. But right from the start, he knew it was no ordinary comet: it had no tail, not even a rudimentary one, and everyone knew comets had tails. Herschel was both wrong and right. He was wrong to believe that no planets existed beyond the five that had been known since the time of the ancient Greeks and that what he had spotted must therefore have been something else. But he was right to believe that only comets have tails (at least when they're within shouting distance of the sun) and that planets never do. That's the way it works in our solar system anyway. But since astronomers started spotting worlds orbiting other stars back in the 1990s, it's become clear that our family of planets isn't the only possible kind. Indeed, the very first exoplanets ever found shattered that parochial belief: the new worlds were huge, like Jupiter, but hugged their stars so tightly that they completed a full orbit in just a few days. And now, one of these so-called "hot Jupiters" has also demolished the idea that planets don't have tails. Careful measurements by the Hubble telescope of a world called HD 209458, about 150 light-years from Earth, show that the planet's atmosphere is continually shedding hot gas. The gas is then caught by the star's powerful particle wind and shaped into a tail that would put any comet to shame. 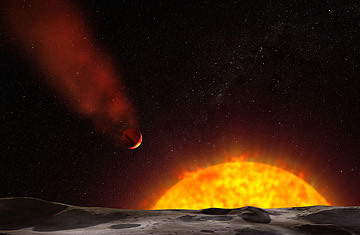 Astronomers have been watching this planet carefully ever since it was first discovered back in 1999. It turns out that HD 209458 is aligned so it crosses directly in front of its star once every orbit. When that happens  every three days or so  starlight passes through the planet's atmosphere on its way to Earth. By looking at how the light is distorted, the scientists have learned that the planet's atmosphere contains, among other things, water vapor, methane, carbon monoxide and carbon dioxide  similar to our own atmosphere in some ways. They've also been able to figure out how the atmosphere is moving: HD 209458 is so close to its star that its blanket of gas heats up to a searing 2,000°F (1,100°C) or so, driving winds of 7,000 m.p.h. (11,000 km/h) and forcing the outer layers of gas to spew into space like steam boiling from a teakettle, some of it at speeds of up to 22,000 m.p.h. (35,000 km/h). That ongoing blast keeps the planet's tail perpetually replenished. Eventually, this process could consume the entire planet, burning it away to nothing, but that would take something like a trillion years. By then, the star itself will be long gone. As for the scientific importance of this discovery, a tail coming from a planet is certainly a curiosity. What matters more is that scientists could tease out all of this information without ever seeing the planet directly, using an instrument called the Cosmic Origins Spectrograph. With devices like this, and with even more powerful instruments on the upcoming James Webb Space Telescope, astronomers hope to probe smaller, more Earth-like exoplanets to see if their atmospheres might be even more similar to ours and bear the chemical signatures of life. This hot, comet-like planet, in short, is just a warm-up.